She delivers high-energy, high-content, and dramatically memorable presentations. Steven Covey’s Executive Excellence magazine named her “One of the top 50 consultants, trainers, speakers, authors and professors who cover the Seven Dimensions of Excellence.” Before becoming a full-time speaker, Patricia enjoyed a successful career in a service industry for 24 years. She owned two highly successful businesses that included training both service and sales personnel. 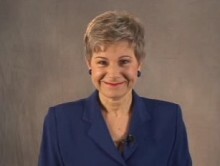 Patricia first received payment for speaking and training in 1976. Since 1980 she has spoken to at least 100 groups a year, many of them repeat engagements. This includes Fortune 100 companies and major associations worldwide. The over 4,000-member National Speakers Association elected her the first female President in 1984. She has won or been awarded every designation given by NSA, including the Hall of Fame and the Cavett Award, the highest honor and considered the Oscar of the speaking world. Patricia is the author of two books, Get What You Want! and Make It, So You Don’t Have to Fake It!, and coauthor of Speaking Secrets of the Masters and Insights into Excellence. She is featured in the Bullet Proof Manager video series, which is sold in over fifty countries. Fripp starred in the popular training film Travel the Road to Success: An Adventure in Customer Service. Do you want to hire Patricia Fripp? Directly request a quote. In 48 hours we can send you the availability of Patricia Fripp If you would like to book Patricia Fripp, Entertainment Booking Agency is the right place. We will offer you the best price and contact the management or we directly contact Patricia Fripp. For corporate appearances or speaking engagements you can contact our agents and the will help you true the process. Tags: hire Patricia Fripp, Patricia Fripp booking, book Patricia Fripp, Patricia Fripp appearances, find more information on booking Patricia Fripp for appearances, Patricia Fripp speaking engagements, Patricia Fripp endorsements/spokesperson, Patricia Fripp appearance fees, Patricia Fripp booking agency contact info, biography of Patricia Fripp, Contact an artist booking talent agent find a speakers bureau that can book Patricia Fripp, speaker booking agency for Patricia Fripp, Patricia Fripp booking agency, Patricia Fripp booking for corporate event. EBA is one of the biggest entertainment booking agencies in the World. We book hundreds of celebrities, artist, athletes and speakers in a year. Important to know is that we are not claiming to be the management of Patricia Fripp. We are not the official agent for Patricia Fripp. Companies from around the globe book these artists and speakers true our company be course we have one of the biggest networks and we always have direct contact with the artist or the management. We help you to find the right celebrities for your corporate of private events. Please contact one of our agents to get free advice and we will help to get the world-famous artist on your party.